It has been many long months since I have started a brand new draft with only endless brainwaves to sift through and get onto paper. Why is writing still this hard?! Alright, alright, I’ll admit — I definitely did not expect NaNo to be a cakewalk just because I won last year. But sitting down to write every day after work has definitely been a change of pace. That’s my fault. I wanted to give myself a break after sending off the manuscript for The Warden of Everfeld: Memento. Aside from a still-unpublished short story I wrote in August and a slight increase in my RSPC posts, I haven’t done a whole lot of solid writing. I mean the sit-in-one-spot and pound out 3,000 words kind of writing… that hasn’t happened yet. It mostly hasn’t happened because I’ve gotten myself stuck on multiple occasions already, over-thinking the placement of a sentence or the ordering of my exposition. I think I’ve covered this before, but I tend to focus too much on writing the best sentences first — I have the best sentences. I need to let go of my inner editor and write with a little more reckless abandon. But I think I’ve figured out how to do that. I’ve certainly read about other writers preparing their “discovery drafts” when they start a novel. Discovery drafts are the polite name for a complete pantser draft, plowing ahead through the story with little regard for plotting or style. It’s a great way to just get your ideas on paper, which is sort of the point of NaNo. Well, I’ve decided that every time I get stuck on a thought mid-typing, I’ll just put it in a bullet note or brackets and keep moving to the next section. I cannot understate how much willpower this will take, but I have a nasty habit of going back to fine-tune my writing anyway. This system of note-taking as I write will allow me to narrate my own train of thought (which I do anyway… wait, I’m doing it now!) and potentially brainstorm underdeveloped ideas while keeping my fingers moving. Is this what discovery drafting is supposed to be? I may have just made that up, but it works for me. I am happy to say that I have pushed out 4,006 words over three consecutive days of writing for The Warden of Everfeld: Legacy. That’s pretty good considering the laziness I faced starting out, but it’s still behind NaNo’s three-day pace of 5,001 words. I’m just happy I wrote for three solid days. Unfortunately, my current streak will end at three. This evening I will be headed up to the mountains with Future Wife and two close friends for a weekend of college football and beer consumption — can’t wait! But that also means I likely won’t touch my draft again until Saturday morning (if I’m lucky) or Sunday evening. Such is life. How’s everyone else doing so far this NaNo? Previous PostMoonlit Musings – ConfuciusNext PostAfter Silence…. Your discovery draft sounds interesting. Good luck! Thanks, it’s working for me so far! I’ve always called that first rough pass through the content my discovery draft. I like being able to gain momentum. I feel better and better as I go, and that helps me write more effectively. I definitely feel more comfortable as I go, too. Setting the scene for the prologue – which sets the scene for the entire book – is a lot of weight to put on my first few pages, but I definitely fell into a rhythm once I stopped sweating the small stuff. 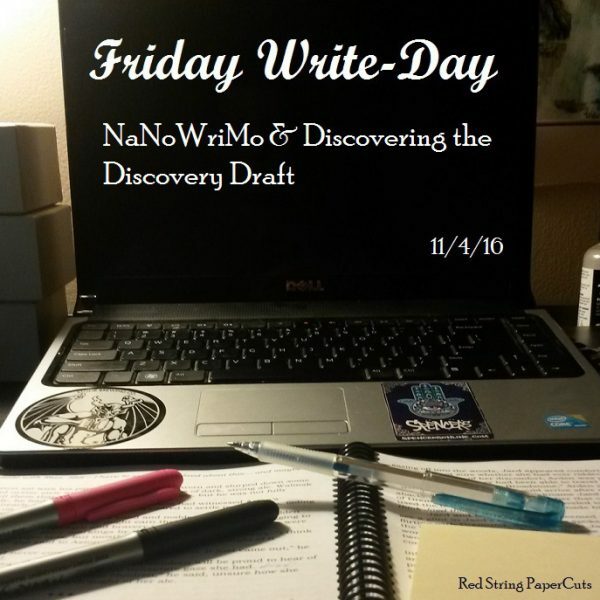 Thank you for sharing about writing a discovery draft; it’s a very helpful strategy.